Tala and his music label, Fiesta Records, gathered a team of lawyers who filed a law suit in the United States. After a drawn out battle that lasted four years, an American court concluded that James Brown had indeed used Tala’s song without authorization. Tala says there was very little financial fallout from the case, with the bulk of the money going to the lawyers. Tala nonetheless contends that it was a huge moral victory and good PR. 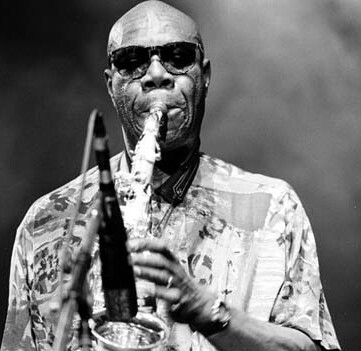 Dibango was in Paris, listening to the radio at his apartment, when he heard something familiar: those same syllables, more or less, in a very different context. The D.J. was playing “Wanna Be Startin’ Somethin’,” the unconventional first song from “Thriller.” It is more than six minutes long, and although the music is exuberant throughout, the lyrics aren’t as silly as they first sound: paranoia (“Still they hate you, you’re a vegetable/You’re just a buffet, you’re a vegetable”) gives way to exhortation (“If you can’t feed your baby, then don’t have a baby”) and, eventually, inspiration (“I believe in me/So you believe in you”). The galloping rhythm sounds a bit like “Soul Makossa,” and near the end Jackson acknowledges the debt by singing words that many listeners mistook for nonsense: “Ma ma se, ma ma sa, ma ma coo sa.” Soon, Dibango’s phone started ringing. Friends and relatives were calling to offer their congratulations: Michael Jackson was singing his song! But Dibango’s pride turned to puzzlement when he bought the album, only to find that the song was credited to Michael Jackson and no one else. Some 25 years later, Jean Marie Tiam, aka Tim, was in the studio in Paris working on a solo album (The duo had disbanded in 1982 but Tim had continued on a solo career) on which he planned to include a remake of “Douala by Night”. Tim was shocked when the studio musicians informed him that the song was not his and that it belonged to American Hip Hop artist Missy Elliot who had released the song under the title “Dog on Heat” (featuring Method Man et Red Man) in her Timberland-produced 2002 album, “So Addictive”. Tim took his complaint to the Société des auteurs, compositeurs et éditeurs de musique (SACEM) "the French professional association collecting payments of artists’ rights and distributing the rights to the original authors, composers and publishers". Recently again, in the run up to the eagerly anticipated 2010 FIFA World Cup in South Africa, another Cameroonian song has been in the news, the subject of another plagiarism charge. In 1985 the Golden Sounds, a group composed primarily of members from Cameroon’s Presidential Guards released an album whose title track Zangalewa was based on a parade song which was popular with the rank and file of the Cameroonian army and whose origins could be traced back Cameroonian riflemen who took part in the Second World War.Zangalewa became an international hit which transformed Emile Kojidie, Victor Dooh Belley and group leader Ze Bella into celebrities (to the dismay of the army brass who subsequently created the conditions that led to the disbanding of the group a few years later – but that is another story). The group also included a few members who were not in the military such as Annie Anzouer who with Ze Bella performed some of the group’s most popular tunes such as Maladie difficile à soigner and the Un bébé, and who later went on to have the most successful solo career among all Golden Sounds members. On May 11, some members of Zangalewa held a press conference in Douala, Cameroon, to inform the media that negotiations werewell underway with Sony and Shakira who had agreed to an out of court settlement and were mauling over the possibility of including the single on Shakira’s next album scheduled to be released at the end of the year. Didier Edo, the group’s manager conceded that it had not been easy to negotiate with Shakira’s manager, Sony Music, and all other interested parties. On one hand, the global exposure has made Ngando really happy. Him image has united Cameroonians for years and will now unite the world. But at the same time, he felt duped. "Those images belong to me," he explains, in an almost apologetic tone. "And it should be up to me to decide whether my image can be used for a film or advertisement"... Did Puma really put Ngando's half-naked image on posters around Paris without consent, or did Cameroon's Ministry of Sports OK the picture as part of the sponsorship deal for the Indomitable Lions? Finally, now that the publicity is out, what can a poor man like Ngando do to stand up for his rights against the government and a multinational corporation? Since the Zangalewa and Ngando Picket controversies broke out, there has been a heated debate on Cameroonian and other internet fora where some have argued that Zangalewa and Ngando Picket should be happy that they are getting a level of international exposure which they would otherwise never have had. What better stage for exposure than the Paris Metro or the World Cup opening ceremony? How much money did the Zangalewa make in their entire career that they now want to feed off the Shakira, and who outside Cameroon knew about Picket before Puma turned him into an international celebrity... for free? In my opinion, these are wrong questions. In fact, it is this kind of cavalier attitude towards intellectual property and indigenous natural resources that have resulted in African regimes auctioning off Africa’s natural resources to Western multinationals, including the ongoing massive land grants being made these days to the Chinese. As Jean Marie Tiam pointed out in the passage on Tim & Foty above, the issue here is first of all about the respect of intellectual property and the right to be acknowledged and credited for one’s work of art. And it is also about being compensated fairly for one’s labor. [As Dolly Parton unequivocally pointed out during her May 21 appearance on the Oprah Show, “Every time [Whitney Houston’s version of “I will always Love you” ]is played, I receive a check”. That is how it should be for all artists irrespective of where they come from. Back to those who believe that the Zangalewa should just enjoy their 15 minutes of fame and shut up, I would like to remind them that Waka Waka is not just any song; it is the official anthem of the FIFA World Cup, the world's most popular and lucrative sporting event. Not only do the Zangalewa deserve a check from Shakira and Sony each time the song is played, they are also entitled to royalties from all FIFA merchandise that will be tied to the song (video games, action figures, toys, ring tones, etc.). From a career perspective, this is the best time for Zangalewa to make use of the moment. For example, having all of their albums and songs available on itunes, releasing a “Greatest Hits” album along with their old videos, and completing their official website which is “under Construction” would be a good starting point. In the meantime, artists who still believe that they can use songs by African artists without authorization or without crediting them should realize that in this age of the Internet, they will be found out and exposed sooner rather than later.